The contemporary violin recital starts here. 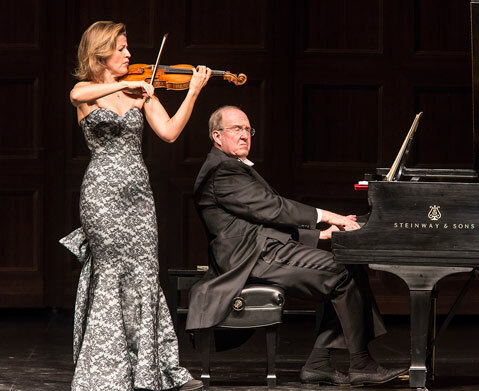 That’s about the size of it whenever Anne-Sophie Mutter deigns to tour with Lambert Orkis, her longtime musical collaborator. Mutter has been a role model to an entire generation of musicians, delivering exorbitantly nuanced performances and recordings that cover the full range of great music for the violin. Blessed as she is with many works that were composed specifically for her, Mutter played one of them, the Partita of Witold Lutosławski, as the opening of her second set this past Tuesday at the Granada. The way that Mutter and Orkis incorporated this late-20th-century composition into their program underscored the freedom and imagination of the older works, while at the same time promoting the piece on the basis of its craftsmanship and relation to the tradition. The first half of the concert was devoted to two of the most sublime melodists in music, Mozart and Schubert. They were represented by compositions — the Sonata No. 27 in G Major, K. 379 and the Fantasie in C Major, D. 934, respectively — that Orkis and Mutter know intimately. The immediacy of the communication between these two was even reflected in the way that they occupied the stage. Mutter, in a silvery gray version of her trademark strapless gown, stood only slightly in front of the piano and so close to Orkis that it appeared as though she could have reached over and turned his pages for him. As Mutter hovered over Orkis, she seemed to delight in achieving the most direct possible blend of her violin tone with that of his piano. The Mozart sounded exactly like Mozart, except when, in the lively second movement, Mozart sounded ever so slightly like Bach for a few moments. Mutter, with her attention to detail and gorgeous, unforced, and open tone, loaded even this relatively straightforward classical sonata with intimations of immortality. The Schubert Fantasie that she played next invited such grandeur and profundity, and it was present in the performance in what felt like exactly the right proportion. Lutosławski may have put more of his time into orchestral compositions than into chamber music, but it is hard to imagine that he ever put more emotion or beauty into anything than he did with the Partita. Each of the five movements has something unique to say, all in a most ecstatic of extended Russian musical idioms. The knack that Mutter has long exhibited for bringing such important music to the public is just one of the reasons why she is revered among practicing musicians at the highest levels. The finale, the Sonata No. 1 in D Minor of Camille Saint-Saëns, split neatly into two parts. The first three movements are mystical in the best sense and show why France took such a leadership role in the development of chamber music in the 19th and 20th centuries. The final movement, “Allegro molto,” employs a perpetuum mobile device, that, while it works to please the crowd, feels a bit tacked on and gimmicky. All that was forgotten, though, when Mutter returned to the stage for a delicious encore, the Habanera of Maurice Ravel. What a successful venue the Granada has become for this kind of concert! Every note could be heard with crystal clarity in a room that can seat more than 1,400 people.